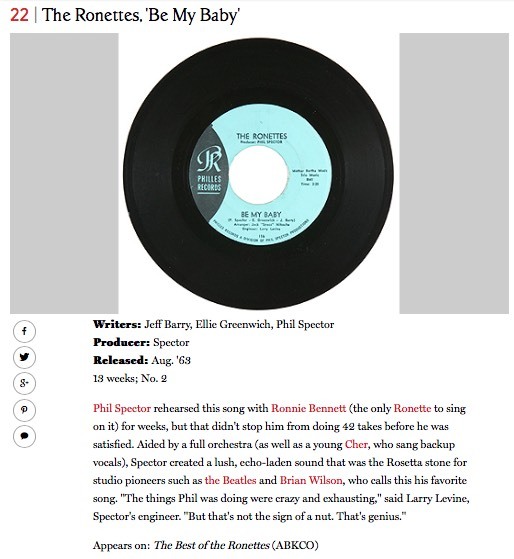 At number 22 in Rolling Stone Magazine’s 500 greatest songs of all time is “Be My Baby” by The Ronettes. This song, released in 1963, was written by Jeff Barry, Ellie Greenwich, and Phil Spector, and produced by Spector. The song is considered one of the most influential pop songs of the early 1960s, with Spector’s elaborate recording sound, his “wall of sound”, influencing artists like The Beatles and The Beach Boys. At number 22 in Rolling Stone Magazine’s ‘500 Greatest Songs of all Time’ is “Be My Baby” by The Ronettes. The only one of these albums which I own is “Let it Be”, although I do have albums by Tom Waits and Roxy Music. I also own songs by The Temptations, ZZ Top, and Jackson Browne. I have heard of Massive Attack, but have no idea who LCD Soundsystem or M.I.A are. “Let it Be” was the last album that The Beatles released, although it was actually recorded before “Abbey Road”. The album was released as the soundtrack to the film of the same name. Paul McCartney had the idea in late 1968 of filming The Beatles in the studio, and putting together a “fly on the wall” documentary of the band which would include live recordings of their performing new songs. The band started filming in Twickenham film studios in January 1969, but the sessions there soon degenerated into bickering and fighting. 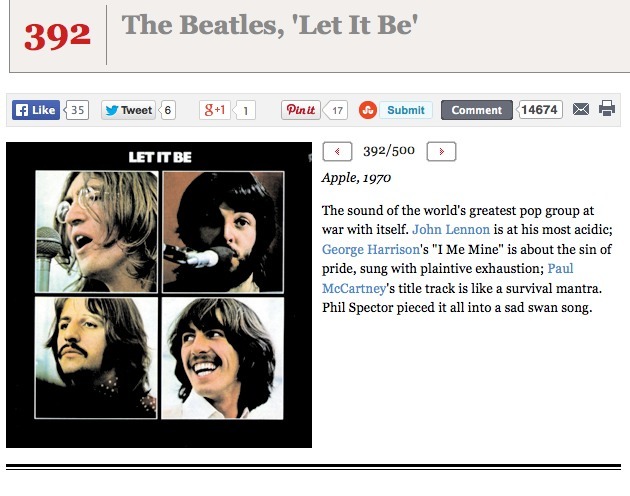 At number 392 in Rolling Stone Magazine’s 500 greatest albums is “Let it Be” by The Beatles. The movie ended up being a documentary about the disintegration of The Beatles, rather than a celebration of their music. Here is the official trailer for the film. The film itself has not been available since the 1980s, and so far has not been re-released on DVD. Apparently The Beatles would prefer it not to be re-released as it casts the band in such a negative light. But, despite the unhappy circumstances surrounding the film and the accompanying album, there is some very fine music on this album. It is the only Beatles album not produced by George Martin. The film and album were abandoned as The Beatles relationship with each other deteriorated. Then American producer Phil Spector was brought in to put an album together. He added his trademark orchestral embellishments on many of the songs, so on songs like John Lennon’s “Across the Universe” for example, the orchestral arrangements were added by Spector. In 2003 The Beatles released a new version of this album, entitled “Let it Be… Naked”. Overseen by McCartney, it features stripped down versions of the songs, so for example one can hear the original “acoustic” version of “Across the Universe”. In general I like the stripped down versions of the songs more than the Phil Spector versions, but both albums are great albums in my opinion. I am surprised the album is so low in the 500 greatest albums list, and below some of the other Beatles albums. I have already blogged about their live performance of “Get Back” on the roof of the Apple building in London. So, today I thought I would include the title track. Although it is one of The Beatles’ most well known songs, “Let it Be” it is still one of their best and a fitting swan-song to the greatest band in history.